in real life. In real life, I'm clearly attracted to women. 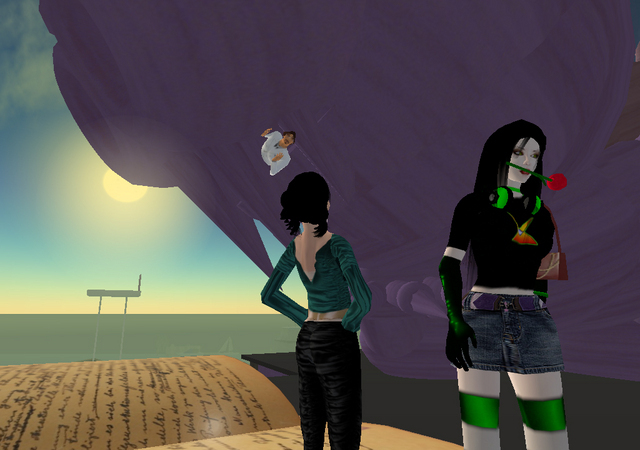 In Second Life, it gets shady. I see my avatar, Jade, and I'm compelled to play a female role.... because it's what she's supposed to do, I guess. I dunno. SL has either taught me a lot about myself, or created more questions. Maybe both." "The answer to this is: ABSOLUTELY, YES! I do because like I said many times over, she's such an exceptional person. Simple as that. The future is a big place so we're just taking it one day at a time, but always open to possibilities. There are certain things that can be faked online, but personality shines through. And she shines so brightly. "I think I would be very nervous yet very excited to meet him in real life--very human, in other words. Our love is like a superset on top of our offline reality. Second Life is a medium to facilitate and channel it through, to do these things that aren't easily done otherwise (like flying unassisted). It's about exploration of self and others. This is exactly what we're doing. We have become more human through technology, and dropped old social stigmas and unlearned baggage from our pasts. And oh, Ham, the book has many more pages, and we'll continue to write them... so this is only the temporal epilogue, I assure you. Second Life continues! *who I have a good feeling has something particularly profound to Comment after this, right in time . . . I'm going to say this annonymously so I don't hurt anyones feelings. I think there is a bit of manipulation going on through all this, I remember when Torley first came to SL and started making friends. HE was an outgoing cat with a cool sense of humor. Then a little while later he ends up starting a blog (which is nifty) and then turns into a "woman"... (I thought this was some sort of roleplaying thing at first"
So I'm just gonna call it what it is. A gay male relationship online. I am not sure how carefully you read what was written -- if you know me, you also likely know I do not relate to the polar terms you are stating. And I hope you've read all of my blog entries on the subject too. ^_^ As I said myself in the article, "As you can see, the labels are really at their shatterpoint..." Humans are a spectrum. The beauty's in that spectrum. I know I'm eccentric for a human being. And even among autistics, I am unusual. (Please keep in mind how differently autistic people view the world.) 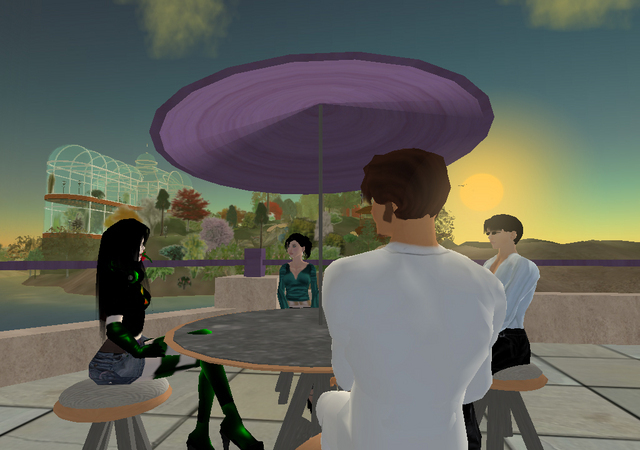 And among relationships, even in Second Life, this is a highly unique one. I treat each person as a unique individual. It would be an insult to my gay, lesbian, bisexual, transsexual, pansexual, trisexual, asexual, etc. friends to lump all of their relationships into generic boxes. And in the end, who really understands the relationship? ONLY those involved. Also, consider the ages-old redundant question, "Is Second Life a game?" It's loaded and there's no final answer, but there is a book being written as the pages are turned. A continuing dialog which I hope will lead to a happier future for those of us who are actively participating in it. A similar thing here. The future's an uncertain place but I know I've had enough pain + suffering in the past. Some say that I am over-happy and too giddy, but you know what? I'm actually *undercompensating*. Here is my opportunity to rejoice and be thankful, which I am so very grateful for, and so... I let the joy flow. Torley and I have been exploring new ways of expressing ourselves. We both believe that, in spite of our sexual orientation, who we are in Second Life is very much an extension of our personalities offline. Just as there are many schools of thought, there are also many ways of conveying our ideas and emotions. Many of those means of expression are not accepted in males by society, but we are fully capable of exercising them. And, we enjoy it. We want everyone to know that there is absolutely nothing wrong with it. We do not believe that there is anything strange about exploring alternative means of expression. It is rewarding to be aware of every facet of your personality, and to be comfortable and secure in who you are. Hammie, this is your greatest story ever. 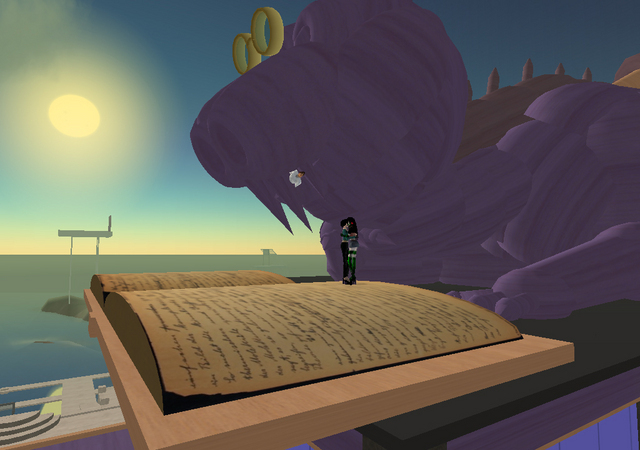 I don't play Second Life, but happened to drop by the blog and felt compelled to comment on this. This was an absolutely excellent article and in many ways a very satisfying and encouraging one as well. For a long time now I have dreamt of a world where gender and sexual orientation would no longer apply. A world where we would no longer fall in love with women or men, but with individuals, their minds. Where we could see beyond the outer shell and love the inside. I am unable to do this myself. I am female and I do not find other females physically attractive. I don't even want to kiss another woman. Eww ;) It still does not stop me from wishing for the world (and myself) to be different though, to be more open and acceptable. An article like this gives me hope, hope that such an ideal world will be possible someday. Humankind will evolve. We should start off by tossing away all of the restricting labels and titles (hetero, bi, trans etc), which only place people in certain boxes and try to limit what is acceptable behaviour for that box. Best of luck, Torley and Jade! Having had the privilege to call both Jade and Torley my friends, I wanted to express my wholehearted wonder and joy at the happiness they have made together! These are two of the brightest stars I have ever met. In life we get conditioned to think of sexual attraction as a prerequisite to love. But all too often in my experience, our bodies actually become an impediment to the true affinity and understanding we are capable of. This is the dichotomy of which Jade speaks, where one is drawn to the spirit but not the body, or vice versa. Well, in this place, two wonderful beings have found a way to transcend that and come to love each other, mind to mind, spirit to spirit. It's remarkable, it's ineffable, but most of all it simply is. And it's pure magic. A simply amazing article, and I think it is beautiful that a meeting of the minds (and souls) takes place like this, and people find things in common to fall into love and be happy and best of luck to you both. p.s. Jade is cool too! Clearly this is a love that trancends borders and sterotypes and compartments and definitions. The labels are at a shatterpoint indeed! As both Jade and Torley know, I'm incredibly excited they have *both* met someone who they can relate to and who makes them feel special. I was very intrigued at the setup, especially considering they are both straight, but it got me thinking that what we're really seeing is love stripped of any and all label and socially defined barriers. In a sense, exactly the way love should be. THat is the maddest thing Ive ever read, fasinating read but strange, strange strange..
Well, I am getting 'caught up' with all of the fascinating goings on in this virtual world, so this is a few months late. I find this fascinating, and encouraging; for anyone to find something so special in life is a precious thing. Most of us have RL lives, and I've been wondering about just how far one should go with an offline one. This article just confirmed to me that, no matter who you are, if you find a connection, it is good:) No matter what the circumstances. Kudos Jade and Torley. What a beautiful story. I don't think most people will *get* how this transcends the human conditon and connects on a more spiritual level. It's not about sexuality, it's not about gender identity, it's about two people who found the greatest treasure fathomable- and they are enjoying it. In reference to the 'A gay male relationship online' from one of the early comments. A question for the commenter and for anyone in general I guess. 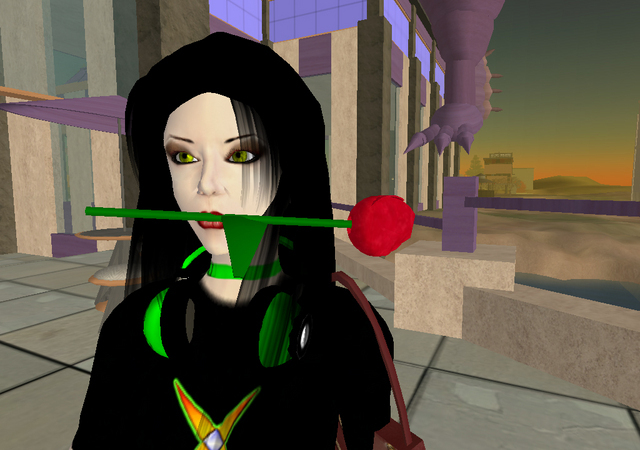 What would we call it if a robot and another robot fell in love in SL? If no gender information was ever exchanged, would this still be a homosexual relationship (homo meaning same, and lack of gender being used by both avs). Another very interesting question to note here would be about 'furries'. If an avatar falls in love with a fox furry, is he considered a practicer of beastiality? I would doubt anyone would go so har as to categorize this type of thing, so why bother trying to place Torley and Jade or anyone else, RL or SL, into a category. People are people. People love people, and if we hope to ever make progess as a human civilization, we will eventually need to be able to ignore these types of categorizations and just let people be themselves, no matter who or what that is. ok thanks for the content and information. like very much to do business with your company. I would welcome the opportunity to introduce you to our line of products.